In the midst of the struggles that accompany us throughout our lives, we discover a resiliency we never knew we possessed and an inherent strength we never expected. By challenging adversity head-on, we reveal someone powerful, independent and self-reliant. As one of the most prolific sculptors working today, Archie St. Clair personifies in bronze this tenacity of spirit, both in humans and in the animal kingdom. His choice of medium – this hard, uncompromising metal – mirrors the inner strength that exists in us all. St. Clair breathes life into his sculptures, not only capturing the movement, form and grace of the body, but the inherent drive within that pushes it to accomplish the amazing. St. Clair’s work is a testament to his own experiences – a talent that may have never revealed itself without tragedy. Growing up in the Australian outback, St. Clair was herding cattle by age 13 and soon found work as a butcher. By age 26, he acquired his commercial helicopter pilot’s license and led a life of enviable adventure, fighting fires, mustering cattle and leading rescue missions. Over the years, he logged more than 10,000 hours of flight time. However, in 1994, his piloting career came to a catastrophic end in a helicopter crash – an accident that left him stranded for 17 hours in subzero temperatures. Confined to a wheelchair after his rescue, he was told by doctors he’d never walk again. Refusing to be a victim, St. Clair discovered a new adventure that would consume him during his recovery and ultimately expose itself as his destiny – sculpture. St. Clair evolved into a self-taught artist, learning everything he could about mold-making, waxes and casting. By the time he regained his mobility, he had propelled himself into a full-time career as a sculptor, a career that only accelerated once he moved to the U.S.
St. Clair’s novel-worthy life offers him the ability to delve into his subjects in a way few artists can. As a former butcher, St. Clair has a remarkable understanding of anatomy. He creates his sculptures from the skeleton-up, constructing the bones, muscles and skins before dressing his subjects to ensure anatomical and dimensional precision. As a lover of history, he immerses himself in his subjects, not only climbing inside their minds to thoroughly understand their personas, but diving head-first into the time period in which he or she lived to ensure accuracy. In the end, every button, every fiber, every movement is realistically accurate and inherently lifelike. The result is so striking, you can look at a piece a hundred times and never notice all the minute intricacies and details. But each time you come face-to-face with his sculptures, you are struck by St. Clair’s unmatched ability to personify the magnitude of one’s determination. 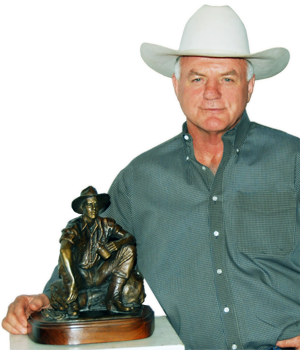 As an artist in Texas and now in St. Louis, St. Clair boasts an impressive client base of government commissions, bronze art connoisseurs and collectors. He is currently a resident artist at OA Gallery in Kirkwood, Mo. where his works, including that of legendary jazzman Miles Davis, are on display. In Australia, his The Pioneer rises above the land as one of the largest horse and rider monuments in the country. As the resident artist of the City of Grapevine, Texas, he captured the colorful characters and inspirational trailblazers that called the city home. And most recently, his sculpture of Fort Worth’s founder rises above the city, inspiring its residents. St. Clair’s significant masterpiece, The Maverick – speaks to the soul by revealing the conflicts, the passions and the dreams within that awaken the spirit’s desire to soar. St. Clair wants his audience to not just see a sculpture, but uncover a timeless story. A story, whether set in history or in the natural world, inspires each person to discover their own inner strength. To tear down the barriers that hold us back from travelling this incredible, chaotic and beautiful journey of life.